Letter from NYC: #492 - Not another post for this week! "We continued our autumn theme at this week. Here are some highlights. Literacy/Language: We talked about where leaves come from, and described what colors they are. We looked at some leaves that I collected outside and identified which was the largest, which was the smallest, which was red, etc. We read We're Going On A Leaf Hunt by Steve Metzger and Leaves by David Ezra Stein. Art: The kids watercolored fall leaves today, and also used corks to stamp out fall foliage on large sheets of paper stamped with a bare tree. These looked beautiful! Look for them next week, along with more artwork that I'll be sending home. Fine Motor/Math: I introduced tongs on Tuesday and the children practiced picking up acorns with them, transferring the acorns from a cup to an ice cube tray. Then we counted them. Using tongs is an excellent way for young children to build hand strength and work on their grasp. Science/Sensory: We examined dry autumn leaves on trays. What sounds do they make? What happens when you crunch them? Some ended up crushed to a fine powder! 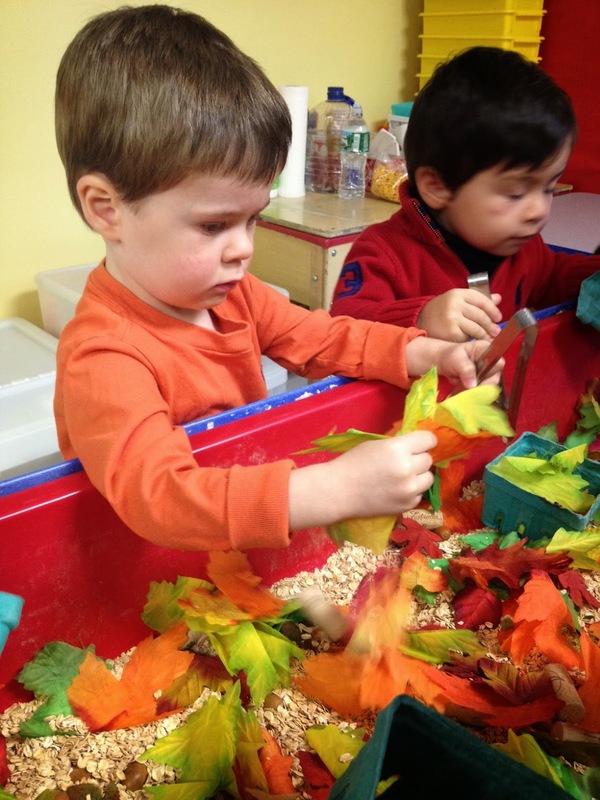 The sensory table was also filled with leaves, acorns, corks, tongs and baskets. The children used tongs to place these items in their baskets, and also used the baskets to scoop up the leaves and dump them out. Movement: We did a "Leaf Dance" to the Blue Danube Waltz by Strauss where the kids pretended that they were leaves blowing in the wind, spiraling towards the ground. This involved twirling around in a circle with a scarf and then falling down on the floor. Endlessly entertaining."